Have you ever wondered about a bike that can beat a Formula 1 racing car ? Then there is an answer for you from the likes of Titanium cruiser bike maker Ecosee Motor works.Ecosee bikes are meant only for the elite few and this new bike the Ecosee Spirit ES1 which is awaiting production.With a starting price of $300,000 and maximum price at $1.5 million is not different from those costly cruiser bikes offered by Ecosee.The American cruiser motorbike manufacturer move to produce a new super bike from the ground up is a surprising decision.You may ask why ? The reason is Ecosee has an established brand value as a premium cruiser bike maker who are well-known for using exotic materials like titanium for their bikes.Titanium is rarely seen on other bikes.The reason for not using Titanium more is the fact that Titanium is pricey than Aluminium and magnesium which are mostly used on bikes. The bike produces 200 hp and weighs only 120.5 kg given the weight to power ratio 1.65:1 this means that for every kg of the bike the bike produces 1.65 hp.This would best the Formula 1 car (weight 640 kg and power 900 hp) which has a power to weight ratio of 1.40:1.For Moto GP bikes weight 153 kg and power 240 hp this equates to 1.56:1.So these figures clearly indicate that the Ecosee Spirit ES1 can match up with an Formula 1 car. 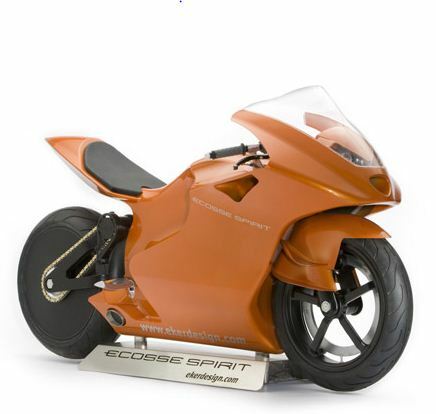 The bike is the world’s lightest(it weighs only 265 pounds (120.5 kgs),fastest (240 mph),best handling and most Aerodynamic super bike.